Even the smallest of our Garden Buildings weighs in excess of 3 Tons - they are substantial structures, not insulated sheds, and are built to ensure that your Garden Office or Garden Room will last a lifetime in excess of 30 years. They are miniature houses, with proper 'breathing walls', ventilated roofs and damp proofing membranes, just like those you would find in a modern timber framed house in Scotland for example. Fully insulated for year round occupation, and fitted with our unique zero maintenance external cladding (timber and render options also available), they are designed to be eco-friendly and cost effective to run. Timber frame buildings are one of the most popular methods of construction worldwide. Over 70% of people in the developed world live in timber framed houses, whilst in the USA and Canada it accounts for 90% of single and double storey buildings. In Scotland, timber frame is the most popular method of construction due to its suitability for cold climates and its inherent high energy efficiency. A RUBICON™ Garden Room or Garden Office is constructed from treated timbers to BS5589:1998 giving an expected life span in excess of 30 years. The Wall frames for our Insulated Garden Buildings are built in factory controlled conditions, from a minimum of 96mm x 47mm C24 & C16 structural grade regulated timber, whilst our roof and floor uses the superior strength C24 grade of timber. This ensures the quality and precision of each component, whilst reducing on-site build time due to the "kit" format of assembly. To prevent the structural panels from deforming under wind-load and potentially collapsing (known as racking strength), the exterior walls of a RUBICON™ Garden Room or Garden Office are covered (sheathed) in structural grade sheets of Oriented Strand Board (OSB3) a high-quality exterior-rated, wood composite board or plywood. The sheathing also helps to reduce wind penetration through the external walls. This is the same construction method as used by well known Timber Frame House-builders from Scandinavian and Germany such as Scandia-Hus and Huf-Haus. Likewise, all our buildings are boarded underneath with 9mm Ply or OSB3 to protect against vermin attack. If not protected in this way, vermin can gain access to the insulating foam panels under the base. To protect the interior timber structure from penetrating rain water, and to allow the building to breathe, a waterproof membrane to BS4016, is applied to the outside face of our Garden Rooms. This waterproof, but vapour permeable layer protects the internal timbers from any water ingress, such as wind driven rain, that may find its way across the cavity between the exterior cladding and the internal timber frame. At the same time it allows any moisture vapour trapped in the panels to escape - hence allowing the structure of RUBICON™ Garden Room or Garden Office to "breathe" naturally. Our buildings are protected on the outside with a Class 'O' (the highest category) rated material that extinguishes flame on contact. It is also protected on the inside with a Class 'O' rated spread of flame material giving a minimum 30 minutes fire resistance. To prevent condensation occurring within the internal wall panels (called Interstitial condensation) a vapour control layer (VCL) to BS5250 is required between the insulation and the internal plasterboard. If a VCL is not fitted then moisture, in the form of vapour, can pass through the plasterboard, through the insulation, and it can then condense on the cold inside face of the outer sheathing, causing mould growth and timber rot. 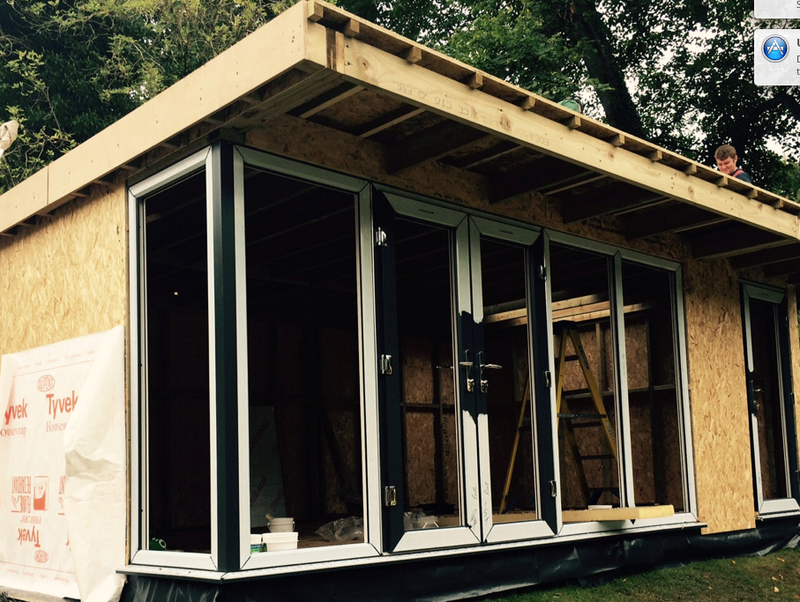 A RUBICON™ Garden Room or Garden Office comes complete with an internal vapour control layer (membrane) to fully meet NHBC and TRADA specifications. The gold standard specifications of our premium range Garden Rooms and Garden Offices offer up to 6" (150mm) of PIR foil-foam insulation (where stated) equivalent to up to 12" (300mm) of fibreglass wool. This is installed as both primary and secondary layers. The primary layer of 50-100mm (depending on model) sits between the timber frames, whilst the secondary layer of 25-50mm sits across the frames preventing cold-bridging from the warm side of the room to the cold outside. If you are not using the room all year-round then, as an option, we can reduce the insulation and save you cost. Our roof construction follows TRADA and NHBC guidelines for the ventilation of moisture laden air through the roof structure by providing cross ventilation from front to rear of the building - just the same as eaves vents on your house. Our designs provide Eaves overhangs with a ventilation grille (giving a 25mm continuous gap along two opposite sides), together with a minimum 50mm clear void for airflow inside the roof cavities. Our flat roof models have a Firestone EPDM one-piece Rubber covering to BS 747:2000 or BS EN 13707:2004 and a drainage fall of 1:80 from the front elevation to the rear gutters. On all our Garden Rooms and Garden Offices, apart from the Cabin Style models, we fit flat ceilings - there is no slope inside, our slope is on the top of the roof. This provides additional usable headroom inside the building, and gives a more 'house like' feel. Another advantage with this construction method is that we can fit ceiling LED downlights, unlike some competitor models which use composite metal roofing panels - these can only fit track lights or wall mounted lights due to the risks of overheating and resultant fire. We can offer UPVC, Timber and Aluminium to suit most budgets. White UPVC is the cheapest followed by coloured UPVC, then timber with aluminium the most expensive. As standard our doors and windows are UPVC with grey exteriors and white interiors. They all have multi-point locking systems so security is not an issue, and they are fitted with double glazed, argon filled 'K' glass as standard with warm edge spacers, thereby meeting the latest Building Regulations. Until relatively recently, standard flooring grade chipboard was the automatic choice for most timber frame buildings. Chipboard is quite durable if it stays dry but if it remains wet or damp for long periods it can swell and lose strength. Moisture resistant chipboard (with better quality glue) is often specified in houses for areas such as bathrooms and kitchens. In a RUBICON™ Garden Room or Garden Office an industrial grade, 22mm moisture resistant T&G composite board is used. This provides good protection during and after construction, even if the boards become wet, whilst also providing an excellent base for tiling, carpet or laminate. Our standard fit is now Wood Fibre Composite but we offer Western Red Cedar or treated European Redwood (details HERE) as a no-cost option. Cedar and Composite cladding materials are used extensively in North America, Scandinavia, and Australia, often in extreme weather conditions. The building is manufactured with a ventilated cavity to stop any driving rain or water vapour penetrating the building. This has the same venting effect as the cavity wall in a house between the internal block-work and exterior brick layer. A RUBICON™ Garden Room or Garden Office with vertical cladding offers a fully ventilated cavity wall, ensuring full compliance with NHBC and TRADA professional codes of practice. All our buildings are dry-lined and plaster skimmed to provide a 'house like' interior feel. All our ceilings are flat inside so you don't lose headroom even though the roof is sloping on the top. Skirtings and architraves (where applicable) are provided to complete the quality feel. All buildings come with a comprehensive package of electrical equipment as standard, with lights and sockets in a choice of chromed, satin or white finish. Sufficient spotlights in the ceiling, plenty of double sockets, twin exterior lights, 2.4Kw electric heater with timer and thermostat, exterior waterproof socket for your lawn-mower and a mains RCD consumer unit all being standard fittings. If you need interior dividing walls and quality oak doors, or even a shower-room with toilet then we can do it, including all ground works for water and drainage.